Disaster has struck in Annie Valentine's well-dressed world. Her daughter Lana has become her worst enemy and she's lost her legendary sense of style. Annie's having a crisis -- a fashion-confidence crisis. And now it seems like her best friend, her daughter Lana, has become her worst enemy. Even Annie's multi-millionairess friend, Svetlana, is having problems. 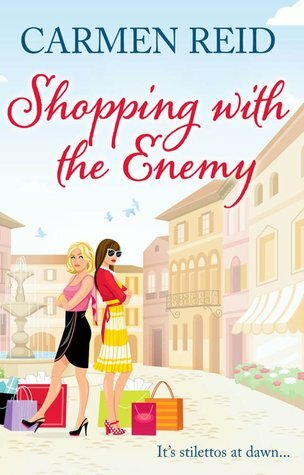 She's at war with her daughter Elena, who's running their Perfect Dress business in New York. A trip to a luxurious Italian spa seems like the perfect solution. But celery juice and pilates can't solve the disasters that are about to strike. Svetlana's ex-husband snatches her sons, Perfect Dress is facing financial ruin and Lana is in all sorts of boy trouble. Will Annie rescue her passion for fashion, as well as saving Svetlana's children? And can mothers and daughters ever truly be friends? As a huge fan of Carmen Reid’s novels and especially her Annie Valentine series I somehow missed the release of the 6th instalment of personal shopper Annie madness! I knew I was going on a couple of long journeys and so downloaded it as an audio book to keep me company in the car. It felt very self indulgent having it read to me, naturally I loved it! Annie has lost her touch, she has become disenchanted with the latest fashions and her label in New York is also floundering. Unfortunately at the start of the novel, the storyline and the characters have also lost some of their sparkle. Its only when the story actually gets going that we see the return of fiery, bold Annie, confident Svetlana, loveable Ed, and the two daughters in New York, lovely Lana and feisty Elaina. I actually found myself loving the storyline taking place in New York more than the storyline surrounding Annie and Svetlana in their Italian spa, this made me feel disloyal to our heroine, but nevertheless I really like the fact that Reid added this sub storyline, it kept the novel feeling fresh rather than ‘just another sequel’. I think that because of this sub-story within the novel, even those who have not read any of the Annie Valentine series before would really enjoy this book, and it would hopefully lead them to the earlier personal shopper novels. Fans of the series will welcome the return of the characters and be pleased to find out what is happening in their lives and careers since the formation of label ‘NY Perfect Dress’. The only part of the story that I didn’t enjoy was the ending, I felt it ended all too abruptly. Reid has obviously left it open to carry on the Annie Valentine saga, but I was left feeling a little empty, I think things could have done with tying up just a wee bit more to give full satisfaction to the reader/listener. This is a must for any Carmen Reid fan. It’s fun, light-hearted, full of delicious fashion and the odd mad caper which is indicative of Reid’s other novels. A quick read for an autumn’s evening! Sounds like a great series! I'm going to have to check them out.